Can you feel it? 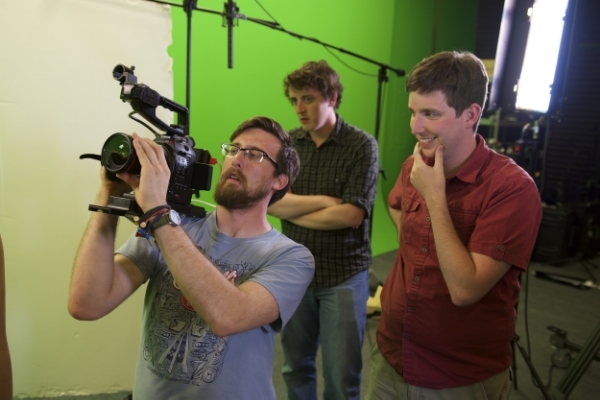 Tomorrow is the start of the Minneapolis 48 Hour Film Project 2015! I just landed in Minneapolis from Columbus, and I’m ready to get down to it. Scheduling a 48 hour shoot is vitally important, because, although the shoot never goes exactly according to plan, if there is a solid foundation the production can always bounce back. Knowing what needs to be done and when is crucial to a successful film challenge effort. The three of us Jackets have worked on our process over the years and have come up with a basic weekend plan that has delivered a film on schedule every time. Below you’ll see a breakdown of our itinerary for each day of the competition. There are a lot of great ways that other teams break down their weekends, but this approach has worked best for us in the past. Remember, for this production, Andrew and I will be co-directing from a script I will write, and Eric will be our director of photography. We will all be on set to monitor the production, keep things on track, and hopefully catch any major disasters before they get too big. The competition starts at 6:00 P.M. with a kick-off party at the Crooked Pint Ale House in Minneapolis. At 7:00 P.M., Andrew, Eric, and I will receive our required elements then rush back to our secret meeting location. We will then spend until 9:00 P.M. or so brainstorming the story we want to tell. We let the required elements drive our story discussion, so it’s hard to account for exactly how long this will take. It’s our goal to make a film that wouldn’t work if the elements were removed. We learned that lesson back when we made All’s Chair in Love and War. With a firm concept in hand, we will break off with me writing the script, and Andrew and Eric will launch into producer mode. They’ll be contacting our cast about any wardrobe requirements we have come up with, and coordinating with our production assistants and post-production crew. While sleep is important in the weekend, we find it’s best to gather resources as much as possible on the first night. Andrew and Eric will go to sleep when everything is on track for the next day. The first draft of the script should be finished around midnight. I will then prod Andrew with whatever instruments are nearby until he wakes up.Andrew and I will review the script, I’ll make any glaring changes, and then we’ll both tap out for the night. Andrew and Eric will start breaking down the visual elements of the film around 5 or 6 in the morning. I’ll join them around 7, and together we’ll determine exactly how we’re going to shoot our story. With that information in mind, we’ll be able to break down the schedule for the production. Our cast will arrive at 9:00 A.M. and we’ll spend the next hour in rehearsal. This will be time for us to get the script on its feet and for us to make any changes based on suggestions from our fantastic performers. We have some talented storytellers and improvisers on our set, and I want to get their feedback at the onset of the production. Inevitably there will be some better ideas for lines or even whole sequences with a fresh group in the light of day, than I came up with in the dark of night. 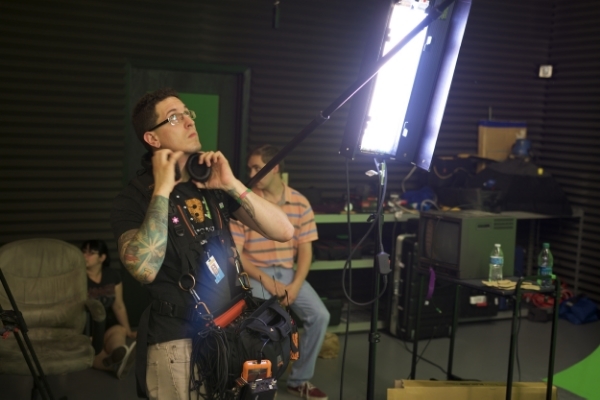 Our emphasis on rehearsal will allow us to fix problems before we commit them to film. We’ll start shooting at 11:00 A.M. This is where co-directing with Andrew will become a big strength. Andrew will be focusing on the visual style of the film and the production coordination, while I focus on the actors. It allows us to be two places at once. I can hone in on the performances, while Andrew ensures that the visuals are effectively communicating the story we want to tell. Even better, we aren’t limited strictly to these roles. That gives us another set of eyes on both visuals and performances. Together, we will catch a lot of things we wouldn’t individually, and the film will be better for that collaboration. We’re scheduled to keep shooting until midnight. The exact details of the shoot are up in the air until we know what we’re shooting, but during this time we’ll frequently run footage over to our editor, Ben Pimlott, so he can cut while we’re recording. Once we’re done shooting, we’ll review the footage Ben has cut together and decide if there are any additional shots or dialogue we need. If we’re in the clear, we’ll move fully into post. If not, we’ll schedule the pick-ups. With shooting done, I’ll tag out for some rest and Andrew, who will get more rest on Friday night will push through with Ben on editing. Sunday morning, Eric and I will join Andrew and Ben around 7:00 A.M. to review the state of the cut. Our goal is to make changes and have the picture locked by 10:00 A.M. This will allow us to then split out the audio of the project for Eric Pagel, who will be doing our sound mix, and Reed Reimer, who will be composing the score. Eric Carlson will, at this time, work on color correction while Ben gets some rest. With the post-production split into three groups, sound, color, and score, we’ll start reassembling the elements as they are completed. Our target is to have everything brought back into a single project ready for export at 3:30 P.M. This will give us a backup copy that we’re able to take to the turn-in, while still allowing us three hours to make any final tweaks. If all goes according to plan, we will turn in the final edit at the Crooked Pint before the 7:30 P.M. deadline, watch Game of Thrones, then call it a night! Sometime after we are awake again, we’ll share our final cut with our cast and crew. We’ll wait until after the public screening to show the film online, but rest assured you’ll hear stories from the production weekend before then! Thanks for reading up on our game plan. If everything goes as smoothly as it is written here, this will be the easiest film challenge of all time! Unfortunately, things never go exactly according to plan… though, that can be part of the fun, too. We’ll be posting pictures to our instagram feed, and making brief updates here throughout the weekend. So stay tuned for more on our fourth Minneapolis 48 Hour Film Challenge!